The Jagged Orbit, John Brunner, Ace, 1969, 341pp. I cannot recall what I was reading at the time, but the gist of it was that Brunner wrote four challenging and experimental novels in the late 60s/early 70s. Of those four, I had read three and considered two of them to be among my top 20 of all time (Stand on Zanzibar and The Sheep Look Up; the other that I had read was The Shockwave Rider, which I like and which should be mandatory reading for cybergeeks, but I don’t think if has the same impact of the other two). The fourth was this novel, The Jagged Orbit. Of the four it is by far the weakest and suffers much by time. However, you can see in the characters of Matthew Flamen and Elias Mogshack the seeds of later ones, especially Chad C. Mulligan of Stand on Zanzibar. (I also sense a similarity with Norman Spinrad’s Jack Barron, but I cannot recall who come first.) 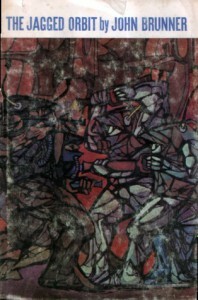 The stylistic changes from his earlier work, and that would make Stand on Zanzibar such a landmark work in SF, are present here mainly in the chapter titles and the structure of the beginning and end. While I hesitate to recommend this to anyone, it proved interesting to me.